While news.com.au remains on top, with Fairfax Media’s The Sydney Morning Herald also unchanged from its position as second, the BBC has managed to fight its way into the top ten. The previous online ratings for the month of May from research company Nielsen had the BBC ranked as 11th, however today’s new figures show the British publication giant has found its way to eighth place, with a unique audience of nearly two million. Other notable changes in the rankings has the Daily Mail Australia switching places with ninemsn News Websites. 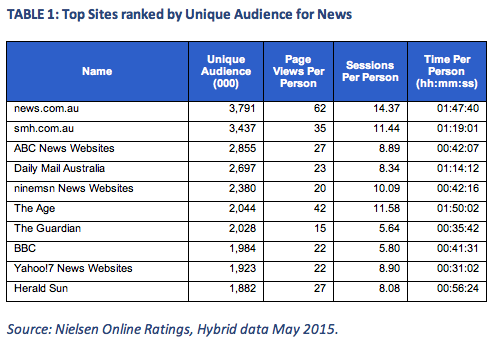 Daily Mail has moved up to fourth place, with ninemsn dropping to fifth. Yahoo!7 has moved down to ninth position. Check out the table below from Nielsen.